Hamas says 'marathon of talks' with Egypt continue and coming hours crucial, as Egypt demands Hamas take 'active steps' to prevent conflict. 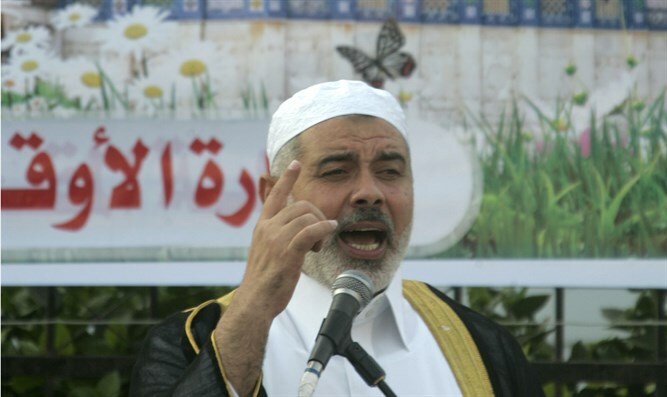 Hamas leader Ismail Haniyeh hinted that if talks do not succeed soon, war may break out. "We are continuing the marathon of talks with Egypt in order to reach serious understandings that Israel will honor," Haniyeh said. "We are at a crossroads, and the coming hours will decide which direction we'll take." Earlier this week, Hamas claimed that Israel "refused" to come to an agreement. On Thursday night, Egyptian intelligence officials warned Hamas that "any mistakes on your part on Saturday may lead to war with Israel." According to Mako, the Egyptians told Hamas that it was their efforts which prevented a war from breaking out a few days ago. Now, they said, Hamas needs to take active and significant steps in order to prevent conflict. Egypt's demands from Hamas included, among other things, stationing Hamas members along the border fence in order to prevent masses of Gazans from infiltrating Israel and to prevent weapons from reaching the border area. On Monday, a rocket hit a home in the Sharon region, injuring seven members of the Wolf family. Hamas initially claimed that the rocket was fired by mistake, later changing their story to say that "bad weather" caused the launch. However, on Tuesday Hamas admitted that the launch had indeed been intentional, and was carried out at Iran's behest. The IDF responded to the attack - which was followed by additional rockets - by striking at Hamas military targets in Gaza.